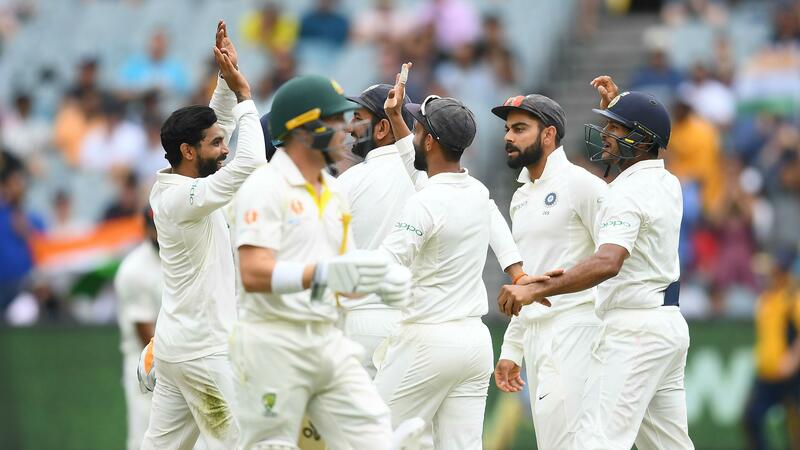 Home > Cricket > India in Australia 2018/2019 – India wins the Boxing day test! India won the Boxing day test in MCG after about 37 years! With this win, India has taken an unassailable 2-1 lead against the Aussies in this four test series. How did the teams fare in the test match? India went into the test match with a big question mark about their openers. Debutante Mayank Agrawal and makeshift opener, Hanuma Vihari, were chosen to open the innings. Mayank looked the part from ball one. His foot work was positive against this high quality Australian pace attack. However, his technique against the spin bowling of Lyon, was the highlight of his batting in both the innings. He looks a bright prospect for the Indian team. On the other end, Hanuma Vihari played the role of a blocker. Looking at his big weakness against short pitched bowling, one is not sure how long Hanuma will continue as an opener. I hope he gets his place back in the middle order. The openers, for a change, ensured that Pujara and Kohli came into bat without any scorecard pressure. They played the typical old school test innings, steady and grinding the opponents to submission. The big partnership between them, ensured that India got a big first innings score, one that the Indian bowlers missed in South Africa and England. Rohit made a useful Sixty, which put the icing on the cake. At the end of the first innings, some cricketing stalwarts felt that India had scored those runs very slowly. Rick Ponting went to the extent of saying in this article, that Pujara’s slow innings might have robbed India’s chances of winning the MCG test. Looking back now, they may realize what a valuable innings it was from Pujara. In my preview to this test, I had commented that if India manages to score 450+ in the first innings, then they would win. The batsmen scored 443 runs and the bowlers did the rest! It was not all great from the Indian batting, in this test match. Their second innings batting display is one that this line up will hope to forget, before they go to Sydney. I think, Virat wanted to play out about 50 overs to ensure that his bowlers got a good rest. Otherwise, the innings looked unplanned and directionless. Everything and Everyone! Indian bowling is going through its brightest period in test cricket. It is not a stretch to call this the best bowling attack in the world today. It has enough variety to win test matches in all conditions. Bumrah was the stand out bowler in this test match. None of the Australian batsmen looked comfortable against him. Bumrah’s variation in length was a revelation. The slow yorker that he bowled to Shaun Marsh, in the first innings, will stay in our memory for a very long time. No wonder, Ashwin has called him India’s Malcom Marshall in one of his tweets!! Bumrah, since his test debut, has been quick, intelligent and lethal as the master was! Alongside Bumrah, Shami bowled extremely well and picked up some key wickets. His delivery to Khawaja in the second innings, was the stand out. Ishant and Jadeja provided admirable support to ensure that the Australian batsmen could never breathe easy in the middle. MCG pitch was not a bowling friendly pitch at all. To bowl so brilliantly, with control and effectiveness, has been the hallmark of this champion bowling unit. It is hard to find a fault in this marvelous performance of the bowling unit. If there is anything at all, it could be their struggle in picking up lower order batsmen’s wickets. Lower order batting. This statement in itself, should say that not much worked for the Aussies in the batting department. Patrick Cummins batted wonderfully well for his 60 odd in the second innings. But then, his innings would have been meaningful had it come alongside a century from a top order Australian batsman. A lot!. Australia made one change in the batting unit, replacing Peter Handscomb with Mitchell Marsh. Otherwise, it looked like a settled unit before the test match. What the win in Perth had papered over was that, none of their batsmen averaged more than 29 in the series. This is the main reason why I stuck my neck out in my preview to say that if India scored 450 or above in the first innings at MCG, then India will win. With this batting lineup, Australian cannot score 450 runs against this Indian bowling line up! Constructing a test innings is an art. The lack of experience in playing big test innings showed in the Australian batsmen’s choice and timing of shots. This injudicious shot selection is one big reason, why most of them got starts and failed to go on to get a big hundred or even an 80. Let us look at their batsman with the highest average, Travis Head. His shot in the first innings is a clear example of injudicious shot selection! What was the need to play that expansive drive at that moment? Some of his shots in the earlier test matches, holing out in the deep, are other examples of why those 20s and 30s did not convert to 100s. All the Australian batsmen should have a look at Pujara’s innings. Once he got past 20 or 30, he did not look like getting out before scoring a century. Pat Cummins, again. Cummins ran in all day, bowling with pace and hostility. His sixfer in the second innings was much deserved for his hard work. The leg side trap to get the Indian batsmen was quite innovative. Hazlewood, Starc and Lyon provided good support to Cummins. But, sadly for Australia, that is all they did in this test match. For some reason, the Australian bowling unit was not as effective as they were in the earlier matches. Cummins was the only one, who threatened to pick a wicket every time he ran in to bowl. May be the pitch did not offer much during the first two days. May be the Indian batsmen’s safe approach to batting, did not give them many chances to get them out. I am not able to place my finger on the right button, but the attack, baring Cummins, looked a bit jaded. It is only the second time that India has won 2 tests in a series in Australia. One could argue that both of them came against an Australian team that was depleted due to extraneous situations. 1977 Australian team was affected by the Kerry Packer affair, while the 2018 Australian team has been affected by the Sandpapergate. But, it does not take anything away from the achievements of the Indian team. India can play only the team that comes up against them. This MCG win is a classic test match win. Bat first, put up a big first innings score and then grind the opponents to submission. Indian bowling and batting unit had to work hard on a wicket, that was not conducive to anyone. This should give the team immense satisfaction. Finally, Happy New year to all my readers! Over to Sydney for the New year’s test.